Play REAL tennis at home! The first-person viewpoint and simulated physics give the sensation of truly playing tennis. The experience of holding a racket and hitting a ball -- so difficult to capture on a TV screen in the past -- has been fully realized in VR. The movement, rotation, angle, friction, and bounce of the racket and ball are fully simulated, and you can even freely perform things like topspin and slices, which cause the ball to spin. It is boring as an opponent COM, which does not make errors at all. An opponent who makes too many errors is boring as well. 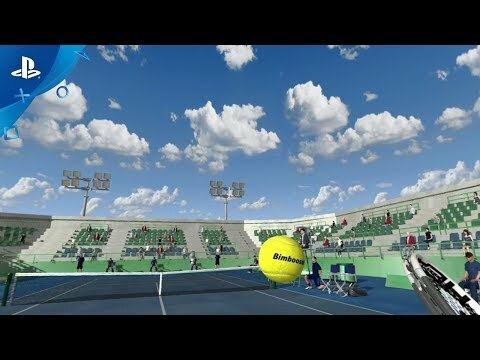 Dream Match Tennis VR has COM with "more human-like" AI "SNITE" which realized natural and realistic play. Because Dream Match Tennis VR realistically reproduces the behavior of the ball, people who are new to tennis or who are not good at sports will still play as it is. But there should be many people who want professional-looking rather than amateur play in the game. For such a person, Dream Match Tennis VR has a powerful shot-assist function. The strength of the assist can be adjusted almost steplessly. The game draws the screen 90 frames per second. At 60 FPS, the ball appears to be blurred, but the game realized a natural and realistic experience by setting it to 90 FPS. You can choose from four movement types: "Auto Teleport," "Auto Real," "Manual Game," and "Manual Real." "Manual Real," which is close to real tennis, is recommended. However, people who feel motion sickness should choose "Auto Teleport."